Tuesday, 6th Jan 2015. Time really flew and today is already the sixth day of 2015. Palm oil futures is believe to heading North for the moment judging from the ability for the benchmark contract to breach slightly above 2,300. "-U.S. stocks were clobbered Monday in an indiscriminate sell-off triggered by a renewed plunge in crude oil prices and surging dollar, which left the Dow and the S&P with their worst losses since October. The S&P 500 SPX, -1.83% closed off session lows but still suffered its largest one-day decline in three months. The index also suffered its longest losing streak in a 12-month period, falling for the fourth-straight session. The benchmark index lost 37.62 points, or 1.8%, to 2,020.58. The Dow Jones Industrial Average DJIA, -1.86% also had its worst down day since October, with 28 of its 30 components closing with losses. The blue-chip index dropped 331.34 points, or 1.9%, to 17,501.65. The Nasdaq Composite COMP, -1.57% shed 74.24 points, or 1.6%, to 4,652.57, while Russell 2000 RUT, -1.46% closed down preliminary 15 points, or 1.3%, to 1,183." "-Mainland Chinese stocks rallied to their highest close in more than five years on Monday, the first trading day of the new year, led by strength in the energy and real-estate sectors. The Shanghai Composite Index SHCOMP, +3.58% popped up 3.6% to end at 3,350.52, marking its biggest daily percentage gain in a month. In the previous trading session last week, the index also finished higher, ending 2014 as the world’s top-performing major equity market with an annual gain of 52%." "-Oil futures fell Monday, stretching their losing streak to a third session and hitting their lowest levels in more than five years on concerns over a surging U.S. dollar and nagging worries of growing oil supplies. Light, sweet crude for delivery in February fell $2.65, or 5%, to settle at $50.04 a barrel on the New York Mercantile Exchange. Prices traded as low as $49.77 a barrel earlier in the session. The settlement was the lowest for a front-month crude contract since April 28, 2009. Prices have lost 7.5% over the last three sessions. February Brent on London’s ICE Futures exchange declined $3.31, or 5.9%, to end at $53.11 a barrel, the lowest settlement since May 1, 2009. Brent has lost 8.3% over the past three sessions." 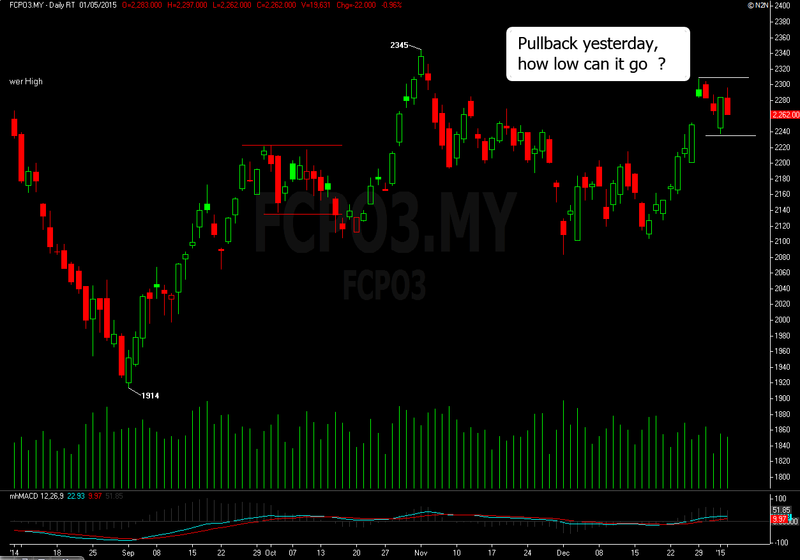 FCPO- Bulls Next Hurdle, 2,310.